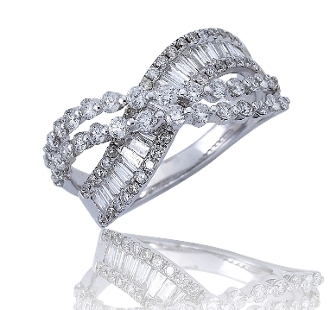 This 14 Karat white gold Diamond wave ring has 1.61 Carat t.w. of brilliant solitaire and baguette Diamonds flow outward from the center in two waves as the baguettes are framed by solitaires. The split shank intersects magnificently, creating an elegant modernist effect. This ring can be worn for many years to come. For added appeal personalize your item, select our Engrave option and indicate size needed when adding to Cart.